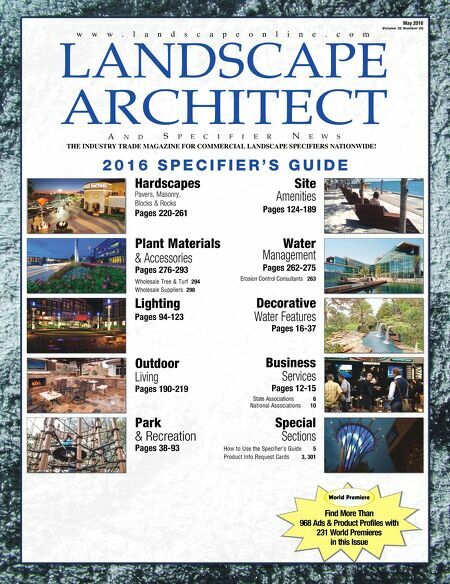 May 2016 2 0 1 6 S P E C I F I E R ' S G U I D E Find More Than 968 Ads & Product Profiles with 231 World Premieres in this Issue Wholesale Tree & Turf 294 Wholesale Suppliers 298 Hardscapes Pavers, Masonry, Blocks & Rocks Pages 220-261 Business Services Pages 12-15 State Associations 6 National Associations 10 Special Sections Park & Recreation Pages 38-93 Outdoor Living Pages 190-219 Plant Materials & Accessories Pages 276-293 Lighting Pages 94-123 How to Use the Specifier's Guide 5 Product Info Request Cards 3, 301 Site Amenities Pages 124-189 Water Management Pages 262-275 Erosion Control Consultants 263 Decorative Water Features Pages 16-37 World Premiere Volume 32 Number 05 w w w . l a n d s c a p e o n l i n e . c o m THE INDUSTRY TRADE MAGAZINE FOR COMMERCIAL LANDSCAPE SPECIFIERS NATIONWIDE!